United States Army Maj. (ret.) 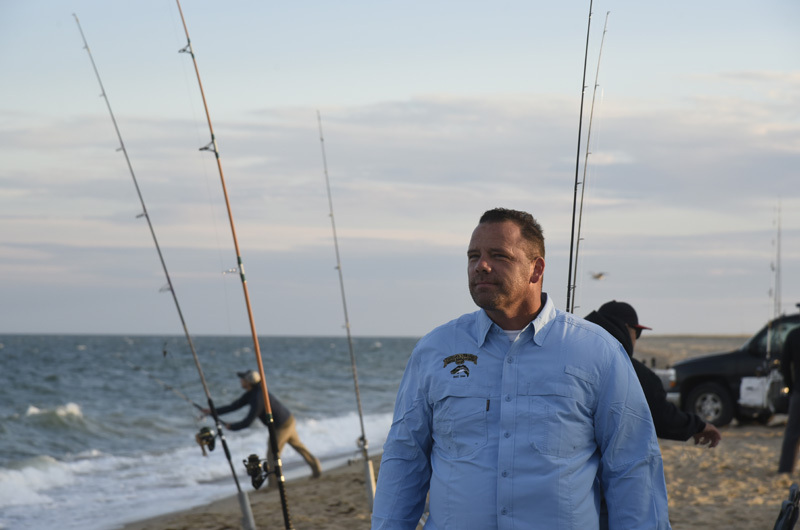 Joey Hutto fishing on Chappaquiddick as part of the American Heroes Saltwater Challenge. United States Army Major (ret.) Joey Hutto is sitting in a low beach chair on East Beach, his blue jean cuffs rolled up and his bare feet buried in the warm Chappaquiddick sand. His wife Michelle is beside him in another chair, her toes buried, too. A 10-foot surf rod sits in a rod holder spiked into the sand, just a few feet away. At the end of the line, a piece of squid rests below the frothy waves, weighted down by a pyramid shaped piece of lead. Similar rigs are set up all the way down the beach in front of a row of four wheel drive vehicles. Nothing much is happening. The falling tide is wrong, the cold onshore wind is wrong. 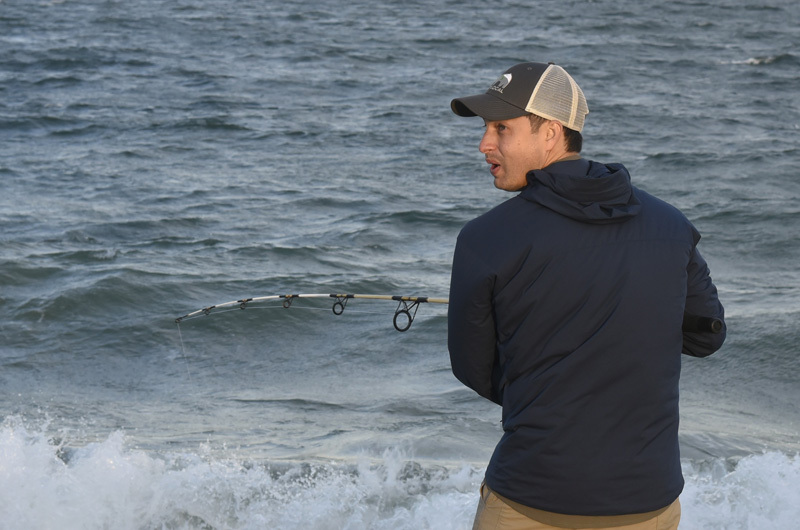 No one is catching any fish, much less a trophy worthy of weighing in at the Martha’s Vineyard Striped Bass and Bluefish Derby. Yet the smile on Major Hutto’s face will just not quit. He is one of seven service veterans who, along with their families, came to the Island this week to participate in the American Heroes Saltwater Challenge. The program began 10 years ago, founded by the Nixon family, who own the Beach Plum Inn, Menemsha Inn and Home Port Restaurant in Chilmark. It’s a way to help veterans wounded in battle get a little respite from their personal travails, and for Vineyard residents to thank them for their military service. Dozens of merchants provide everything for a memorable Vineyard vacation, from charter excursions to gourmet meals, to lodging. Major Hutto, from Wetumpka, Ala., spent 22 years in the Army, more than eight of those years in combat. He said this week has helped the long process of healing wounds. Major Hutto is not the only veteran on the beach who is beaming a broad smile. Marine Corps Corporal Michael Mack of Auburn, Wash., is watching his two children shriek and laugh as they stand in the surf casting into the waves. He did three deployments in Iraq. Derby committee member Janet Messineo is showing the children how to handle the rod and reel, while keeping a careful hand on them to make sure they don’t tumble down the steep beach. The good will flows both ways. Derby committee member Mike Cassidy said he enjoys meeting the veterans every year. Fred Ruhlemann is a Viet Nam veteran who comes from his Connecticut home every year to fish the derby. He came out to see the young veterans and offer his support. At Derby headquarters Wednesday evening, the veterans gathered to weigh in the fish they caught earlier in the day. The highlight of the week in the saltwater challenge is when the Island’s charter boat fleet volunteers their time and equipment to get the veterans out to the fishing hot spots. The veterans hauled in cooler after cooler of fish to be weighed. While the scene is familiar to derby anglers, the veterans seemed to be a bit bewildered by it all, as if they suddenly realized how big a deal this really is for Islanders. Their biggest problem seemed to be whose fish was which. No one had a broader smile when the derby headquarters opened its doors than Marine Corps Staff Sergeant Rafael Lopez Jr., from San Antonio, Tex. 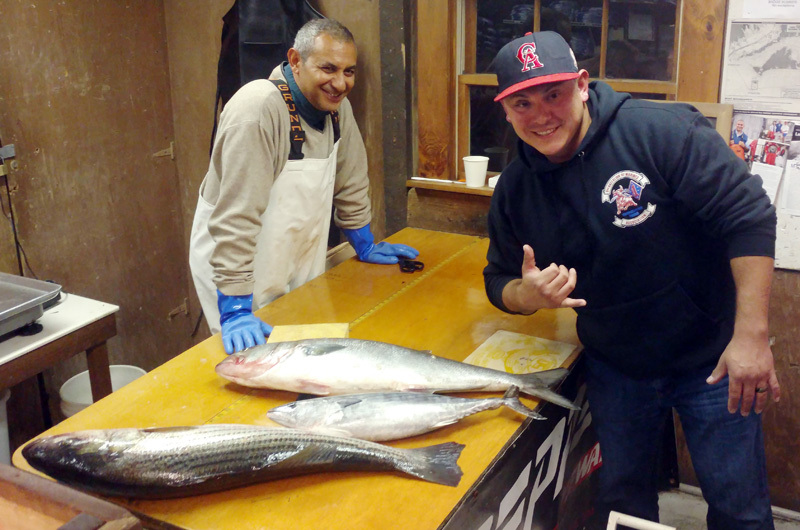 He hauled a striper, a bonito, a false albacore, and a hefty 13-pound bluefish out of the coolers and walked up to the scales. Major Hutto was still smiling at the weigh station Wednesday evening, hours after leaving chilly East Beach. Michelle Hutto had just weighed in her striped bass and then he put his own striper on the table. When the scale’s electric blue numbers settled down, he gave a little fist pump. 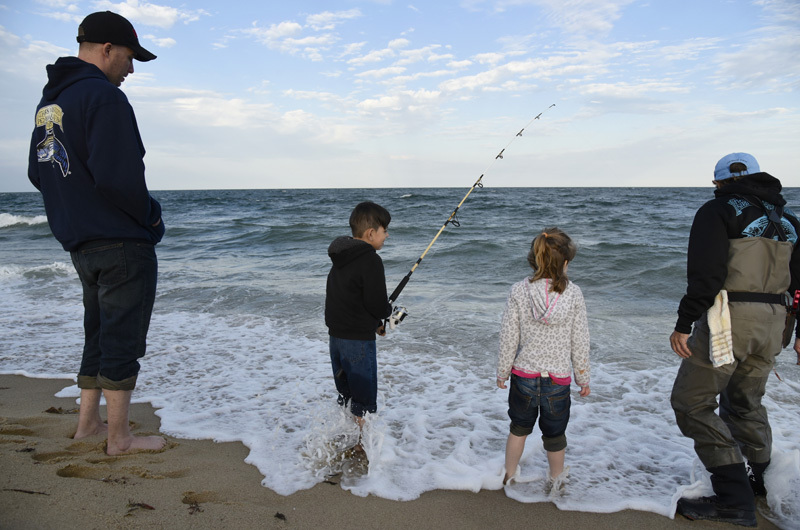 The 72nd Martha’s Vineyard Striped Bass and Bluefish Derby ends Saturday evening at 10 p.m. The awards ceremony follows Sunday at 1 p.m., at the Farm Neck Golf Club. The awards ceremony is free and open to the public. what a wonderful way to show gratitude to these Veterans. Bravo. Thank you to our Veterans and to the Nixon family. So wonderful to see such creative thinking, and bringing these ideas to fruition. What a wonderful way to show our Veterans we do care and respect them for serving our Country. If you are looking for more volunteers for this project, please contact me. Way to go Bob and Sarah.... your family has made this happen.